East Midlands Trains staff at Sleaford station have been dealing with passengers affected by the disruption caused to the rail network by a major fire which broke out at Nottingham station in the early hours of this morning (Friday). Twelve Nottinghamshire fire appliance crews have been tackling the blaze within the main concourse of the station buildings and no trains are expected to be passing through the station today (Friday), say the rail operators. The evacuated station is a hub of the East Midlands rail network and it has meant many services have been cut short or stranded on certain sections of the track. 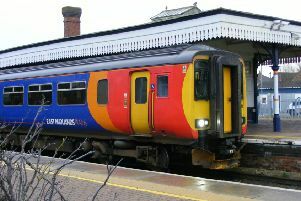 Numbers of trains on the line to Boston and Skegness via Sleaford have been limited to a handful as a result and all trains are stopping at Grantham, a spokesman told The Standard at Sleaford station. As a result the station at Sleaford was unusually quiet for what is a crossroads of north/south and east/west rail travel in Lincolnshire. Trains from Lincoln to Nottingham have also been affected, stopping at Newark. Passengers have been able to switch to other operators to use alternative routes, such as East Coast Mainline, but most people have been advised if their journey is not essential to avoid travelling today. Routes affected include trains on the Nottingham/London St Pancras, Matlock/Nottingham/Newark, Nottingham/Mansfield/Worksop, Leicester/Lincoln/Grimsby, Nottingham/Grantham/Skegness and Liverpool/Nottingham/Norwich routes. An East Midlands Trains spokesman stated: “We are working to run as many services as possible. All routes are subject to short notice cancellations or alterations. “If you have not already started your journey please do not travel unless it is is absolutely necessary. There will be a limited replacement bus service to the Nottingham Jurys Inn for those who have already started their journey. The following train companies will accept East Midlands Trains tickets on their services via any reasonable route: Virgin Trains East Coast, Virgin Trains, Transpennine Express, CrossCountry, London Midland, Greater Anglia.